Even though the EMU soccer women couldn’t notch an upset at No. 15 Lynchburg College in their season finale, they still secured a home game on Monday’s first round of the ODAC Tournament. Based on other results around the conference, Eastern Mennonite (8-9-1 / 4-6-0 ODAC) will be seeded No. 8 in the 10-team tourney and host No. 9 Randolph College (5-10-1 / 4-6-0 ODAC) Monday night at 7:00pm in Harrisonburg. With the game occurring on Halloween night, fans are encouraged to wear costumes. There will also be candy to give away. The Royals picked up a 2-1 win when they played Randolph in their regular season meeting in Harrisonburg just this pastTuesday. The winner of Monday’s first round game advances to Wednesday’s quarterfinals, where they will play at top seeded Washington and Lee in Lexington, Va. The last time EMU’s soccer women hosted an ODAC Tournament game was 2006 when they beat Lynchburg College 1-0 in the quarterfinals. That is also the last time the Royals advanced to the semifinals of the postseason tourney. In Saturday’s meeting in Lynchburg, the powerful Hornets (13-1-3 / 7-1-2 ODAC) got on the board in the seventh minute. EMU’s defense held tough and kept the margin at 1-0 until LC scored again in the 35th. Lynchburg’s depth made the difference in the second half, adding four goals for the final 6-0 margin. Emily Young (Fredericksburg, Va./Massaponax) started in goal and racked up 11 saves in 67+ minutes of playing time. Leah Wenger (Harrisonburg, Va./Eastern Mennonite) added three saves the rest of the way, while the back line was also credited with a defensive save. 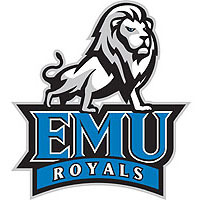 Laura Rittenhouse (Harrisonburg, Va./Eastern Mennonite) had EMU’s only shot.